It seems that every year gets shorter and the kids grow faster!! I am greatful for such a great year with so many accomplishments (especially from my amazing hubby!) and fun memories!! 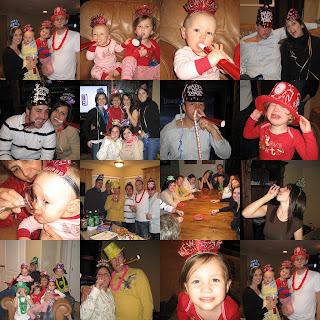 Here are some pictures from our night of CELEBRATING 2007!! 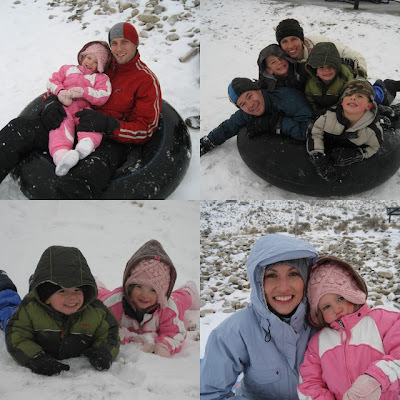 We decided to go sledding with all the new snow! We had a great time and the kids enjoyed it too! I couldn't believe how brave Abby was. She was going down the hill all by herself, and it was a pretty big hill! We just want to tell our parents thanks! We are so grateful to you for putting up with us for three weeks. We had such a great time and loved being home and spending time with you! Thanks again for being the best parents and grandparents ever!!! We love you! Abby was so excited that Santa ate her cookies and the reindeer ate her carrots. Audrey on the other hand was sad because there wasn't much left for her to eat!! Abby got all princess stuff just like she ask for! A beautiful princess scooter and a princess cash register. She had such a great time. Now that the holidays are over she is still asking me if Santa can bring her more princess stuff! Hopefully she will get tired of asking, because I know I am tired of answering "maybe next year". Christmas morning was so much fun!! It is great to have a little three year old who gets so excited! It really brings the magic of Christmas alive. Well the girls were spoiled to say the lest as well as Levi and I. We have the best parents ever!! 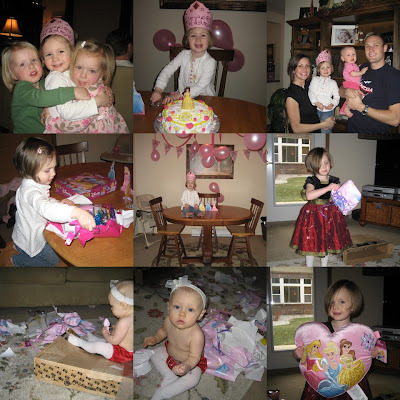 Here are some cute pictures of the girls and all the many presents they accumulated that morning! Although Audrey loved her presents, I think she liked the wrapping paper and bows the best!! 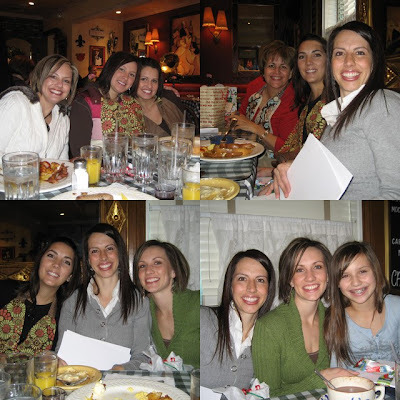 We had our annual My Favorite Things lunch with my mom, sisters and niece. We get together around Christmas and give each other our favorite things. This year was so much fun, we ate at Mimi's Cafe and exchanged gifts. Lots of fun present... thanks girls sure love you!! We had such a fun Christmas party with a special guest... Santa!! The kids were absolutely thrilled and excited to see Santa. Abby couldn't keep her eyes off him. She had to give him about 10 hugs and kisses and sit in the front row while all the other kids were having their turn on Santa's lap. It was really cute, because the last few years she has been really scared of him. Now Audrey on the other hand was terrified as you can tell from her picture, but I guess you always have to have one picture like that! 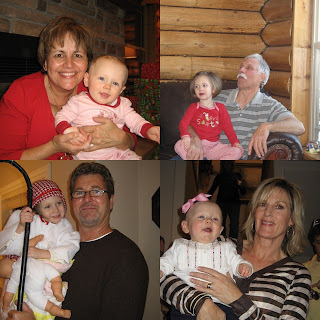 What a fun tradition, every Christmas mom gets all the grand kids together for the annual COOKIE PARTY! The kids get to decorate and eat cookies to their hearts content! And let me tell you I have never seen a cookie with so many sprinkles, I couldn't even see the frosting. Abby sure loves sprinkles!! 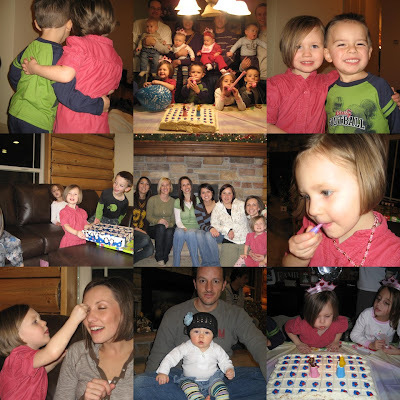 Well Abby turned 3 on December 9th. She had two wonderful birthdays, one here in Spokane with all our great friends and one in Utah with all our families! She was definitely spoiled, In fact I think she got more for her birthday then she did for Christmas!! I had no idea that there was so much princess stuff on the market. Everything she got was princess and there were no duplicates. Audrey felt like it was her party too!! She has never been so happy with all the wrapping paper and boxes!! Thanks to everyone that came, each of you really made her day special! Here are my cute girls in their Christmas dresses. I absolutely love having girls. It is like I'm a kid again and get to play dress ups every day with my dolls! But these dolls are way better then any dolls I ever had growing up!! OK I know that it has been forever since I have posted anything! But the good news is there is a lot of new fun pics and stories from the holidays, keep checking they should be posted soon. Sure hope everyone had a wonderful Christmas and New Year! !